Human 5HT2B Receptor. BLAST analysis of the peptide immunogen showed no homology with other human proteins. Synthetic 17 amino acid peptide from 3rd cytoplasmic domain of human 5HT2B Receptor. Percent identity with other species by BLAST analysis: Human, Chimpanzee, Gorilla, Orangutan, Gibbon, Monkey, Marmoset (100%); Bovine, Rabbit, Pig (88%). HTR1B / 5-HT2B Receptor antibody was raised against synthetic 17 amino acid peptide from 3rd cytoplasmic domain of human 5HT2B Receptor. Percent identity with other species by BLAST analysis: Human, Chimpanzee, Gorilla, Orangutan, Gibbon, Monkey, Marmoset (100%); Bovine, Rabbit, Pig (88%); Dog, Bat, Panda, Horse, Opossum, Stickleback (82%). Small volumes of anti-HTR1B antibody vial(s) may occasionally become entrapped in the seal of the product vial during shipment and storage. If necessary, briefly centrifuge the vial on a tabletop centrifuge to dislodge any liquid in the container`s cap. Certain products may require to ship with dry ice and additional dry ice fee may apply. 5-HT2B, a Serotonin Receptor, activates phospholipase C upon binding serotonin, which results in a rise in intracellular calcium. It is known that 5-HT2B regulates cardiovascular function during development and in adulthood; mice lacking functional 5-HT2B receptors died of heart defects during gestation or neonatally, and adult mutant mice displayed cardiopathy, including myocyte disarray and ventricular dilation. 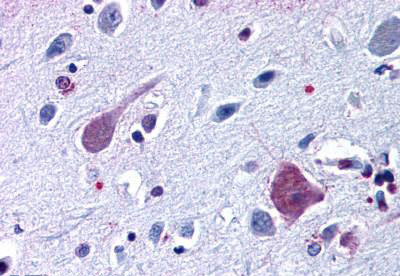 Anti-5HT2B Receptor antibody IHC of human brain, cortex. Immunohistochemistry of formalin-fixed, paraffin-embedded tissue after heat-induced antigen retrieval. NCBI/Uniprot data below describe general gene information for HTR1B. It may not necessarily be applicable to this product. 5-HT(2B): This is one of the several different receptors for 5- hydroxytryptamine (serotonin), a biogenic hormone that functions as a neurotransmitter, a hormone, and a mitogen. This receptor mediates its action by association with G proteins that activate a phosphatidylinositol-calcium second messenger system. Plays a role in the regulation of impulsive behavior. Belongs to the G-protein coupled receptor 1 family. 1. results of the present study suggest that the HTR2B polymorphism is not likely to be associated with personality traits, including novelty seeking and impulsivity.